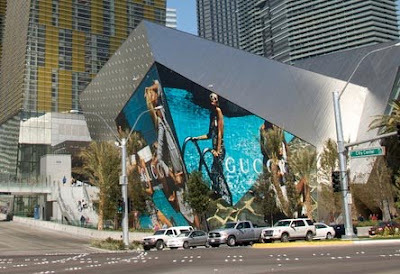 Building "Wrap" advertisements are very popular in Las Vegas. Hotels and shows love to use the side of buildings to promote their product. Here's one that I just noticed recently. It is advertising the opening of a Gucci store inside the Crystals shopping mall at CityCenter. The store is scheduled to open sometime in 2010.